National Gallery of Victoria, Melbourne, Felton Bequest 1988. 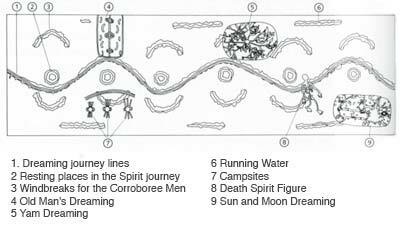 This painting, on a canvas 7 metres long, shows a central stylised songline and depicts many of the Dreamings which pass through the artist's country. One of these, Yam Spirit Dreaming (also depicted in ITEM 4.1, Imagining landscapes), portrays the full ecological associations of the yam plant. In theory, at least, the whole of Australia could be read as a musical score. There was hardly a rock or creek in the country that could not or had not been sung. One should perhaps visualize the Songlines as a spaghetti of Iliads and Odysseys, writhing this way and that, in which every 'episode' was readable in terms of geology. By singing the world into existence, he said, the Ancestors had been poets in the original sense of poesis, meaning 'creation'. No Aboriginal could conceive that the created world was in any way imperfect. His religious life had a single aim: to keep the land the way it was and should be. The man who went 'Walkabout' was making a ritual journey. He trod in the footprints of his Ancestor. He sang the Ancestor's stanzas without changing a word or note – and so recreated the Creation. 'Sometimes, we'll come to a ridge of sandhills, and suddenly they'll all start singing. "What are you mob singing?" I'll ask, and they'll say, "Singing up the country, boss. Makes the country come up quicker.'" ... just as, in the Dreamtime, the country had not existed until the Ancestors sang it. An English traveller's attempts to comprehend the deeper meaning of the Aboriginal idea of 'singing the land' is the focus of a recently published documentary novel, That the Englishman got much of it 'wrong', or at least 'not quite right', is perhaps less important than the vivid picture he paints of the subject's intricacy and coherence and even of its relevance and importance to European thought. The following extract records the conversation of two whites: the traveller and an Australian (sympathetic to Aboriginal culture and hired by the railways to learn from Aborigines the sacred sites which should be avoided by a new Darwin to Alice Springs railway line) who ponder these mysteries. British appropriation of the land we know today as Australia was first implemented by establishing boundaries within that land mass and by naming the areas thus created. This new partitioning, while socially meaningful to Europeans, did not incorporate, indeed failed even to notice, pre-existing boundaries sanctioned by daily usage, confirmed over millenia, and sacred, in the religious sense, to a sizeable population. As we shall see, these pre-European patterns of land usage and control enabled the Aboriginal peoples to survive and prosper, that is to live and to live well, over a geological time frame. In the last forty thousand years of Aboriginal settlement, volcanoes were born and died. Vast climatic changes reduced the average temperature by six or seven degrees and then raised it again. Sea levels fell by perhaps one hundred and fifty metres as ice sheets formed, then as warm weather returned, the sea also came back (even higher than before), gradually falling a few metres over the last five thousand years. Changes in the terrestrial environment throughout this period were correspondingly great (of a scale much larger than that predicted for the much-discussed greenhouse effect). Of course, the transformation of the terrain, and of the flora and fauna, required major changes in Aboriginal sources of food and water. Thus, Aboriginal land tenure matured not in a changeless setting, as is sometimes believed, but in a dynamic and trying environment which required knowledge, ingenuity and adaptability of the culture. 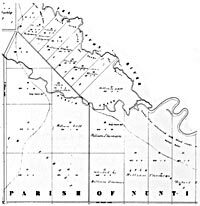 Detail of original survey map: Country Lands in the Parishes of Nuntin and Bundalagua, Gippsland, 1851. 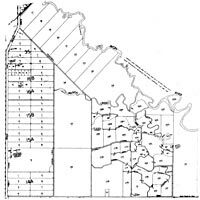 Detail of map: Parish of Nuntin, Gippsland, 1982. Europeans did not recognise, as such, the practices by which Aboriginal land boundaries had been established and through which they were maintained. Nor did they appreciate the abstract knowledge, the practical and conceptual skills, the structures of authority, the belief systems or the social mechanisms through which control was exerted. Yet these practices were there for the seeing and no doubt attempts were made to explain them in much the same way that the Aboriginal peoples who have regained possession of their lands explain them today. The boundaries which Europeans failed to notice for nearly two hundred years are validated by social practices (conceptual tools, behaviours and material implements) which are, legally, morally and rationally, no less compelling as a mechanism for legitimation than those employed by the newly arrived English-speaking settlers. Thus ignoring subtle, but highly sophisticated, regimes of land tenure and usage, the new settlers set about making the land their own by creating an entirely new and, in the main, arbitrary set of boundaries, based on abstract principles which were for the most part unrelated to the land itself. These principles, taking no account of topography or climate, plant or animal life, or previous human occupancy, were nevertheless a highly refined product of human rationality, just like those they over-rode. They incorporated a complex and strongly hierarchical network of knowledge and power. It was a network made possible and secure at every level by a vast array of technologies large and small. This European knowledge-power network prevailed over that of the original inhabitants, and thus enabled cloistered administrators, some situated ten thousand miles away, to bring European concepts of order to this unknown continent and to invest the newly bounded parcels of land in people without prior claim to the land. Soon pieces of paper with inscriptions like those we see in ITEMS 5.3 and 5.4 began to circulate. The most significant of these inscribed documents were kept in safe places, as they still are (the Titles Office and banks), only to be brought out on socially significant occasions when land is to be reassigned or boundaries modified. In two hundred years these practices have changed little, and indeed they are remarkably similar in European settlements around the globe. The practices by which Europeans created boundaries and thus units of land in Australia may seem remote from contemporary problems or from any idea of Australian culture, yet they form the background of daily life. Entirely taken for granted, even when we bring them into focus as a set of concepts, behaviours and instruments, these practices may often seem simply commonsense approaches, the only rational procedures, even somehow inevitable. Yet historically they are tightly bound to European notions of individual and community, ownership and law, hierarchies of social class, systems of agricultural practice, and attitudes towards nature. They are not easily separated from the use of Indo-European languages and the number system.